Now that the new year has arrived, you are likely thinking of ways you can better yourself. Whether this is your health, your career goals, or something else, everyone is striving to be their best self at the beginning of January. One of the resolutions you may have set for yourself is to make your home a safer and healthier place to live. At Earthwise Pest Management, our new year’s resolution is to continue providing you with high-quality pest control that leaves your home in better shape. If you want to make sure that you have a pest and rodent free 2018, let us tell you how you can make it happen. Do you have any idea what the number one reason pests enter homes is? You may think that it would be pests trying to find shelter, but this is actually not the case. Pests are most often looking for something to eat. It doesn’t matter whether its leftover drops of soda that spilled down the side of your trash can or fresh fruit that you have sitting in a bowl on your counter, pests will get to it one way or another. Keeping this in mind, it’s imperative that you make it a point to keep your kitchen cleaner in the new year. If you don’t you can be sure that you will have issues with pests infiltrating your home in 2018. While it may not be easy to keep track of things that you are not commonly looking at, making sure that the seals around your doors and your windows are secure is a must. Even if a crack looks minuscule, it could be the exact right size to allow a pest in. So even if you are not used to taking notice of these things, we would encourage you to make a mental note to do so in the coming year. It could mean the difference between have no pests and having many. While you may not understand how the exterior of your home could factor into the types of pests that come indoors, it absolutely can. Pests love to hide in the dirt, grass, trees, leaves and more. If you have a yard that is messy, the chances of you having pests are fairly high. These pests can be tracked into your home each time you walk from the exterior to the interior, leading to an eventual infestation. If you want the inside of your home free of pests, be sure the outside of your home is as well. If you store firewood next to your home, you may want to consider moving it away. When pests see a large wood pile, it’s much like a child seeing a large swimming pool on a hot day in the summer…there is no stopping them from jumping right in. With this said, move the wood at least 10 feet away from your home to prevent future pest infestations. If you are currently storing anything in cardboard boxes, now might be the time to reconsider. Pests, especially mice, really love cardboard and will not think twice about chewing it up and using the pieces to make nests. We would suggest you take this year to move all the things you are storing in cardboard into plastic containers. Not only are they more sanitary but they also look much nicer and are easier to move. If you want to start the new year on the right note, it’s time to ensure that your home is prepared to defend against pests. You can do this by contacting Earthwise Pest Management today and asking for a free quote. We would be happy to answer any questions you may have about our pest control services. 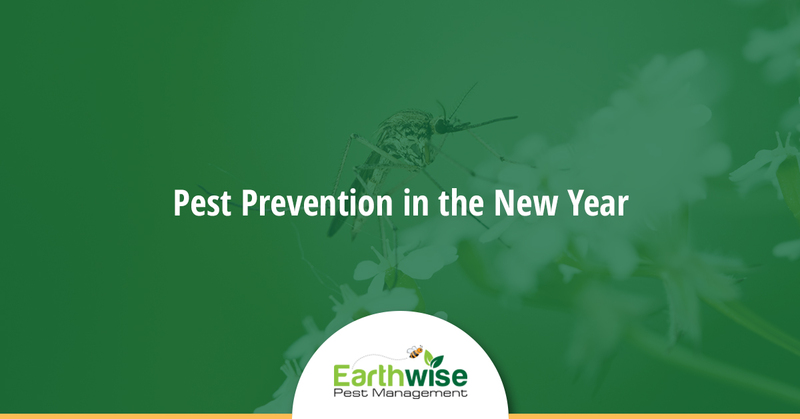 Call right now and have a happy new year from Earthwise Pest Management!